Battelle‘s Matthew Shaw has outlined what he says is a growing focus of U.S. and international government, intelligence and law enforcement organizations on technologies to detect and classify biological threats that are both natural man-made. Shaw, head of the CBRNE defense business within Battelle’s national security segment, writes in a piece published Monday on Homeland Security Today that the Defense Department is working with international partners to build up their biosurveillance and biodefense postures. He says the bioterrorism threat also includes naturally occurring incidents, such as the Ebola virus outbreak in West Africa. The Defense Threat Reduction Agency and the Centers for Disease Control and Prevention have also led efforts to establish international cooperation to address the need for threat awareness, response and recovery, Shaw says. However, he also indicates that the field of CBRNE defense faces challenges due to the pace of biotechnology advancements and the cancellation of the BioWatch Generation-3 program. The biological attack detection system was designed for continuous collection and analysis of air samples for aerosolized biological threats in a faster process compared to the existing Gen-2 variant. 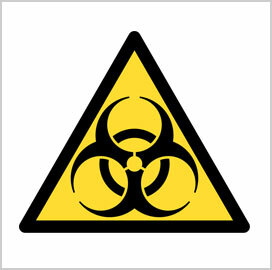 According to Shaw, both domestic and international organizations are continuing to develop programs with the goal of achieving the earliest possible detection and response of biological threats. “As the worst-ever outbreak of the Ebola virus in Africa has underscored, developing public health and defense systems capable of real-time detection and identification of naturally-occurring or nefariously-produced biological agents — and to do so on budget and on schedule — is essential,” he writes.